周良才, 包继永, 吴丽群, 陈晓敏. 武汉市2016年不同环境蝇类孳生现况调查[J]. 中国媒介生物学及控制杂志, 2018, 29(6): 645-647. ZHOU Liang-cai, BAO Ji-yong, WU Li-qun, CHEN Xiao-min. Investigation of breeding situation of flies in different environments in Wuhan, 2016[J]. Chin J Vector Biol & Control, 2018, 29(6): 645-647. Corresponding author: CHEN Xiao-min, Email:174818235@qq.com. Abstract: Objective To investigate the breeding situation of flies in different environments in Wuhan and to provide scientific evidence for fly control. Methods To investigate the breeding situation of flies in different environment in Wuhan from May to October 2016 by visual method. The fly larval breeding rates between different months were compared with χ2 test. Results A total of 5 094 breeding sites were found, and there were 320 fly larval breeding sites, with a mean fly larval breeding rate of 6.3%. The fly larval breeding rate in different environs ranged from 0 to 16.8%. 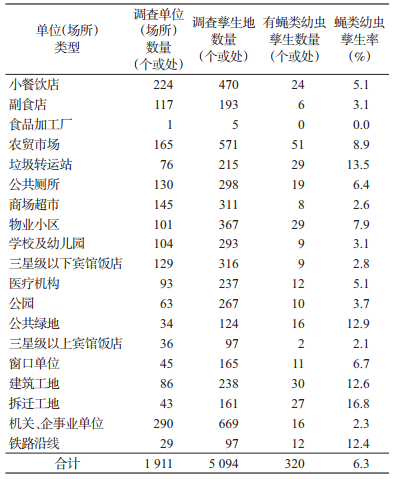 In the demolition site, the fly larval breeding rate was the highest, accounted for 16.8%, followed by the refuse transfer station 13.5%, the public greenbelt 12.9%, the construction site 12.6%, the railway line 12.4%, the farm produce market 8.9%, the real estate district 7.9%. The breeding rate of fly larvae in food processing plants was the lowest, i.e. 0. The fly larval breeding rate in May was the highest, accounted for 7.8%, and lowest in October, accounted for 5.7% (χ2=2.967, P=0.085). Conclusion To master the breeding situation of flies in different environments of each type of habitat in Wuhan city, to provide good background information for the prevention and control of flies in the future, as well as disease vector management in hygienic city campaign. 龙建勋, 彭莱, 肖珊. 2014年长沙市内5区苍蝇孳生地现况调查[J]. 医学动物防制, 2017, 33(1): 95-97. 王陇德. 病媒生物防制实用指南[M]. 北京: 人民卫生出版社, 2010: 104-113. 中华人民共和国国家质量监督检验检疫总局, 中国国家标准化管理委员会. GB/T 23796-2009病媒生物密度监测方法蝇类[S].北京: 中国标准出版社, 2009: 2-3. 中华人民共和国国家质量监督检验检疫总局, 中国国家标准化管理委员会. GB/T 27772-2011病媒生物密度控制水平蝇类[S].北京: 中国标准出版社, 2012: 1-2. 钱新荣, 高强, 徐康, 等. 上海中心城区夏季蚊蝇孳生情况调查[J]. 中华卫生杀虫药械, 2014, 20(1): 75-76. 钱国华, 赵春元, 张美菊, 等. 集体食堂蝇类防制工作中存在的问题与防制对策[J]. 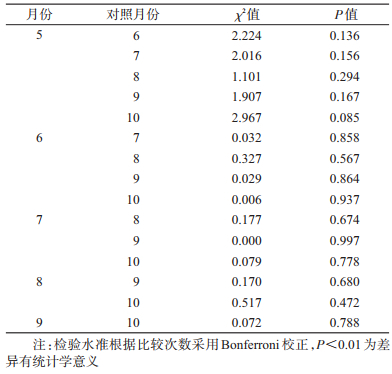 中国媒介生物学及控制杂志, 2009, 20(1): 17.